Posted byAnthony Ihrig	 August 29, 2011 June 23, 2013 Leave a comment on BG Festival, Wisconsin Style! 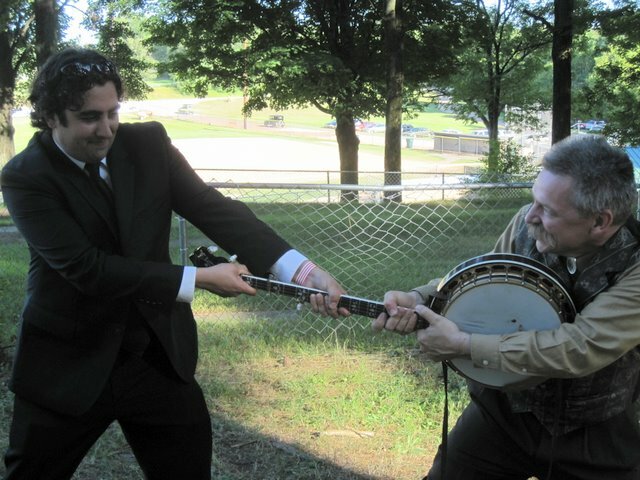 Anthony & Dale in "Dueling Banjos II: Deathmatch (Uncensored)"
Just got back from playing with The High 48s at an incredibly fun bluegrass festival in central Wisconsin called Bluegrass in the Pines. It is hosted by one of my all-time favorite bluegrass bands, Art Stevenson and Highwater. They have managed to put together an event that combines a great location (literally in the pines – full of shade, soft ground, fragrant air etc. ), with top-notch music (Bluegrass Patriots, Briar Pickers, Hand-Picked Bluegrass, Sloppy Joe etc.) and one of the most amazing, fun-loving, appreciative bluegrass crowds I have ever had the pleasure of playing for. Highlights include: the dancing at every set (day or night), the all-ages crowd (infants to elderly), the top-notch jam circles, the local microbrews (New Glarus and Central Waters available on-site), the authentic Wisconsin dinners (fried cheese curds and beer), hangin’ with Highwater and, of course, the final uber-jam version of “Will the Circle Be Unbroken” to finish off Saturday night… Amazing!